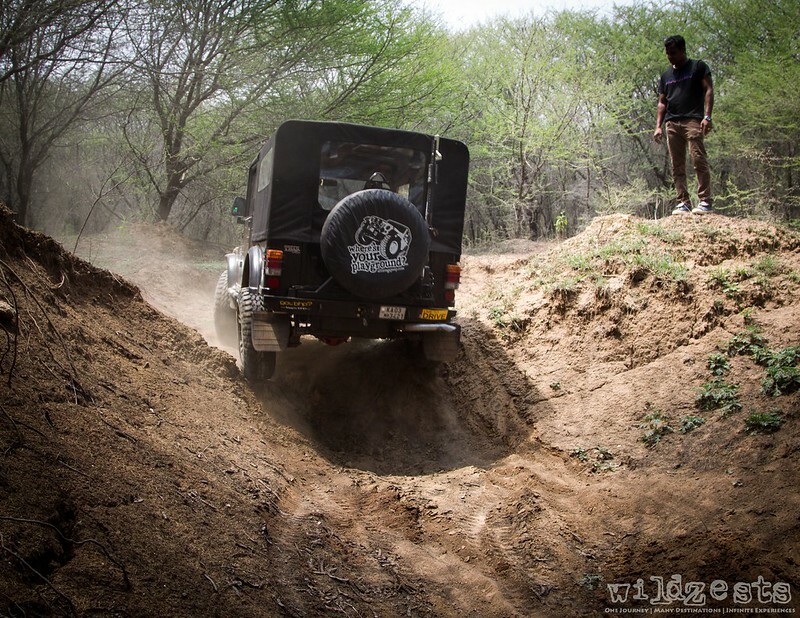 Post the Chennai event in March which was more like a teaser, I wanted to go out and practice a little more by myself, but a newbie off-roader like me should never go out alone. Having some company always helps in boosting your confidence and allows you to stretch a little more than what you'd do alone. 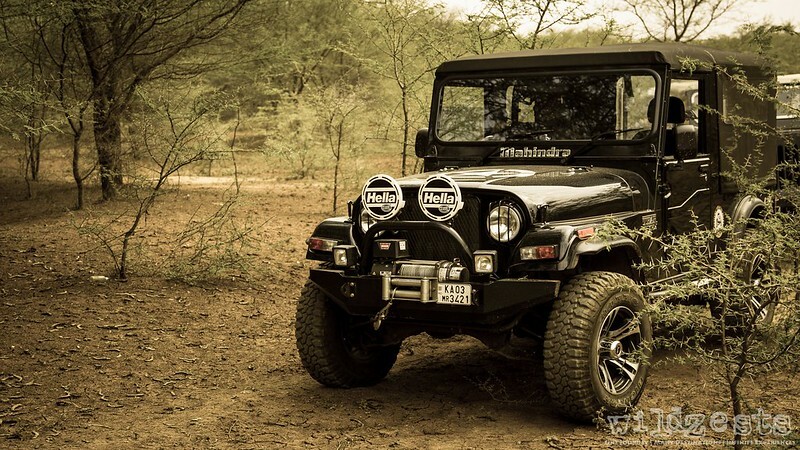 So the plan was discussed with my jeep buddies and the location was finalized to be the Bidaraguppe lake in Sarjapur. 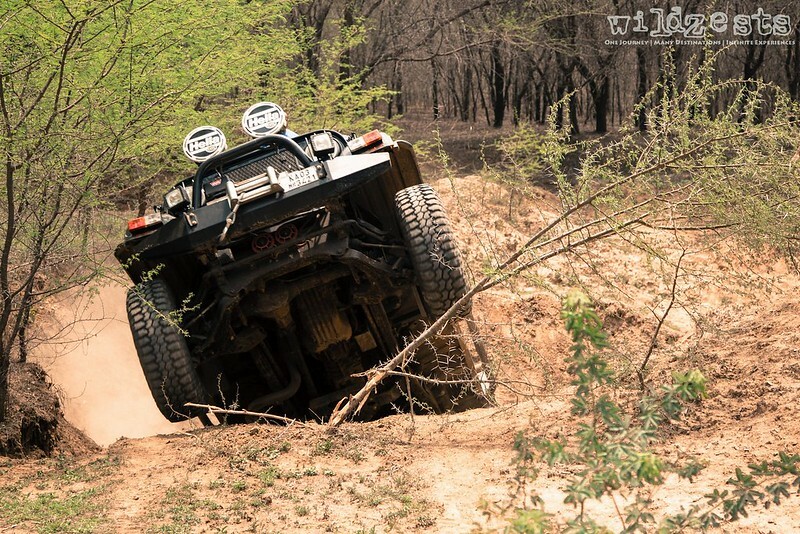 The terrain is a dry lake bed with a lot of ditches and mud, the chances of getting stuck in mud were moderate but the risk of damage was not going to be very high. But as with every great plan, even ours didn't really take off. One fine morning, I saw a FB update by Dwarak sir checking for participation for a Sunday morning OTR at Bidaraguppe. That did it, I instantly said yes! Even though most folks were busy that weekend, I did have Abhay confirm that he'd join me so the plan was still on. About 12 jeeps were in attendance for the event with 2-3 marshal jeeps. We started off with some quick breakfast on Sarjapur road and then drove to the entry point of the lake bed off the highway. We had a couple of marshals from the BODA club I guess, that helped in keeping the group regulated through the obstacle course while Dwarak sir captained the whole group. A quick briefing was done for the do's and don'ts since there were quite a few first-timers as well. Soon after, we were all trying out different entries and exits in the various ditches across the lake bed. 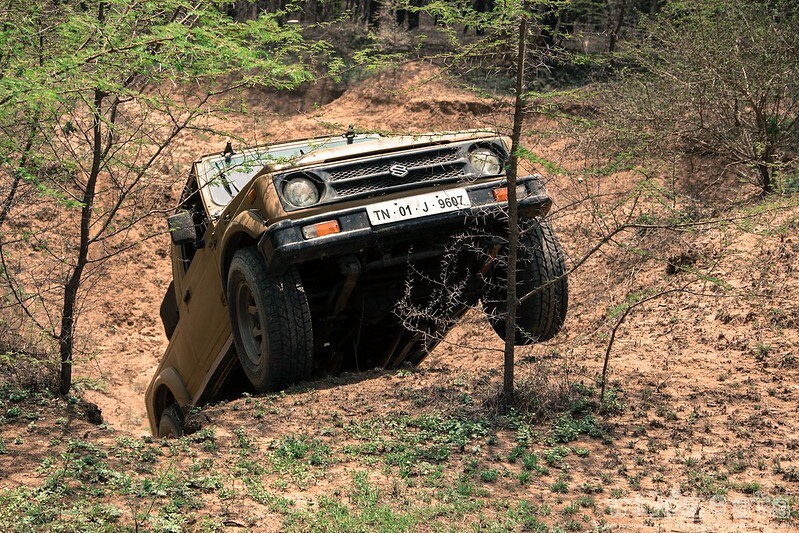 I was amazed to see how easily Dwarak sir could identify possible routes which looked difficult at the outset but once the marshal vehicle did it, there was no holding back for any of us. 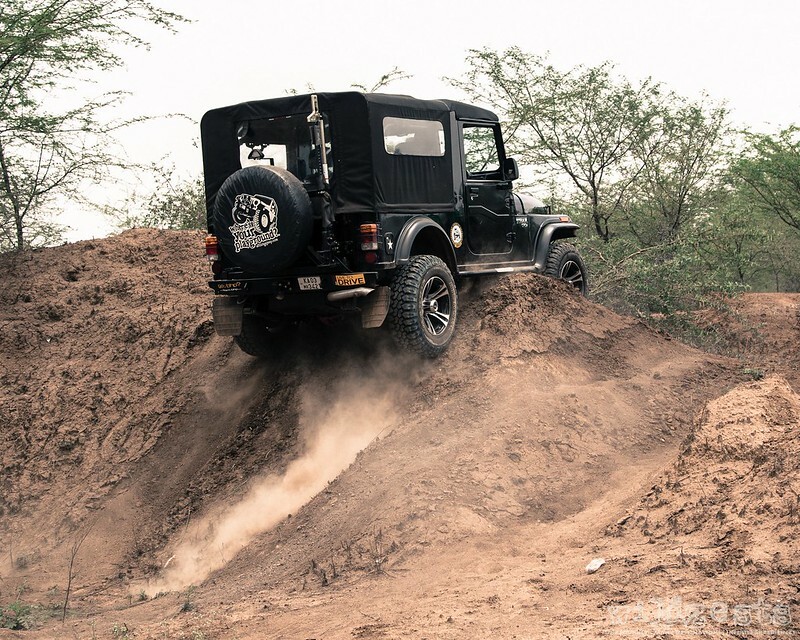 The first course was tried with various different combinations entry and exit points and my Thar performed flawlessly all through. There were a few jeeps that struggled a bit since they missed following the marshal's instructions but no major issues were reported. 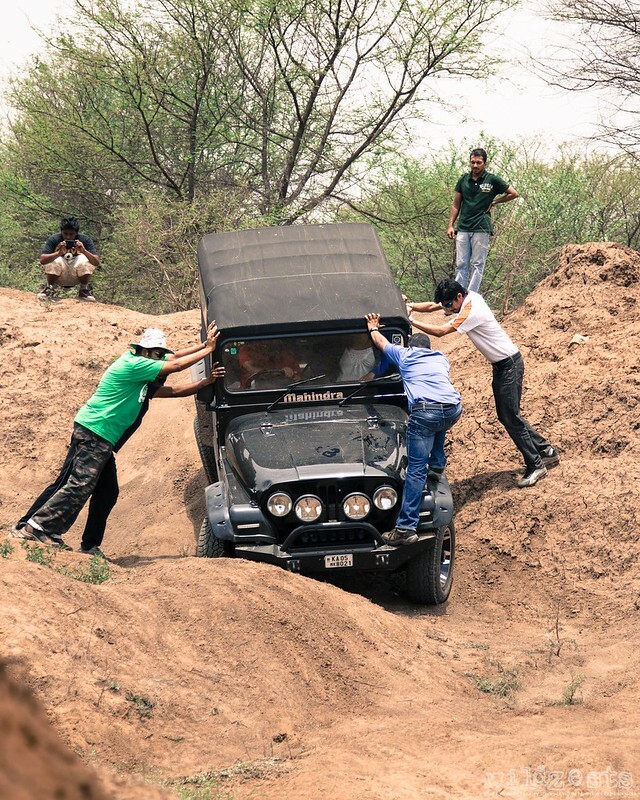 Moreover, there were enough and more people to help in pushing and rocking the jeeps out of a sticky situation. The terrain was pretty harsh with thick growth of thorny Babul trees (Prickly Acacia) all over the place. Since there were no marked trails, one had to navigate through these trees every now and then. You could hear screeching sounds as the jeeps got scratched by the huge thorns. Despite my doubts, the soft top took all of it quite well. I still think it will be time to replace the soft top in about a year from now. By then, it would have suffered enough abuse to retire gracefully. Next up, we did some trail driving through a large rut in the ground with uneven surfaces on both sides to reach the next obstacle. This one was where the entry point was nothing short of a 60-degree nose-dive to get inside the 15 feet deep cavity and then there was a right turn which was more like an articulation pit followed by a mound where it was more than likely to beach the jeep if there wasn't enough momentum. But what was more interesting was the exit point where it was impossible to come out without having the front wheels in the air for a short while. 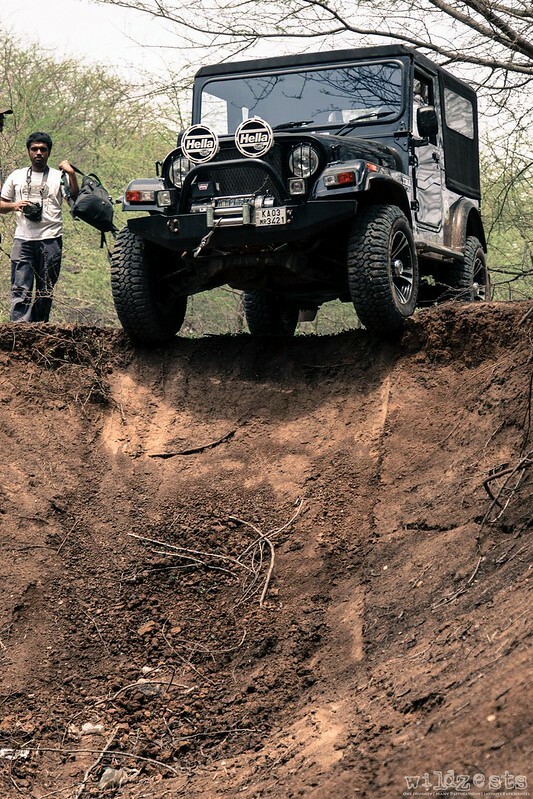 The strategy was very simple, the situation demanded enough momentum to get the jeep over the edge and pushed a little further by virtue of the short flight and then once the front tires are on the ground, you could gain traction to pull yourself out from the ditch. There was only one problem though, the first two successful attempts were made by the gypsies. 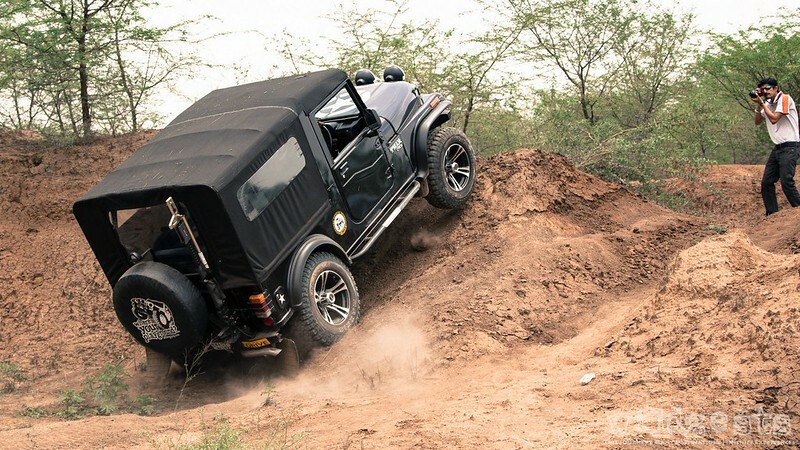 They in any case would fly over obstacles because of the lighter weight and lack of articulation when compared to jeeps. 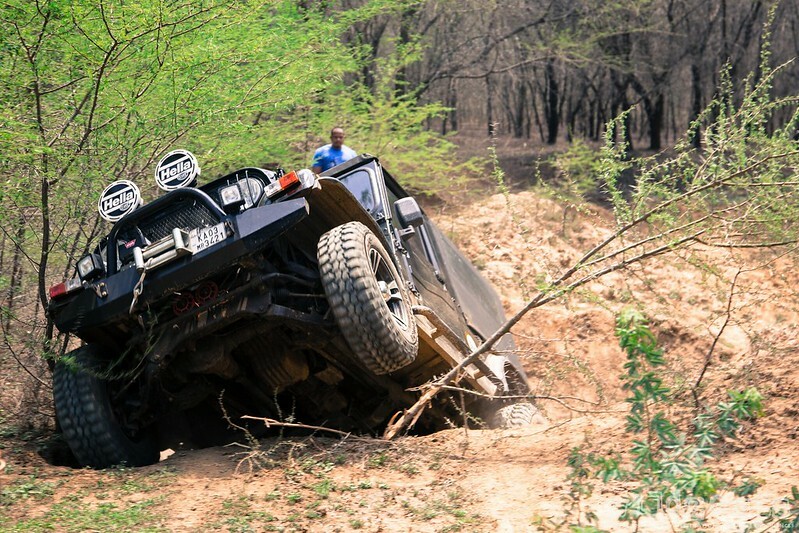 Only four vehicles attempted this and the only other jeep that did apart from me had gotten royally stuck with a broken clutch even before the exit point. 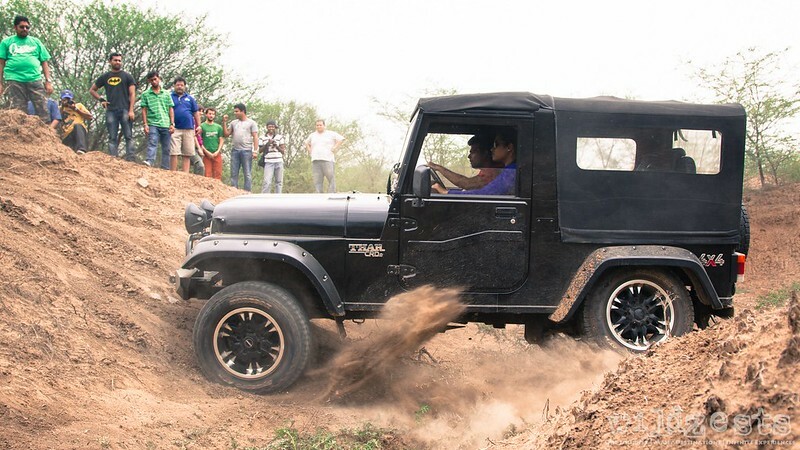 Surprisingly, it came out of the ditch with the help of a veteran offroader who demonstrated how you can conquer difficult terrain with the jeep even with broken essential components. 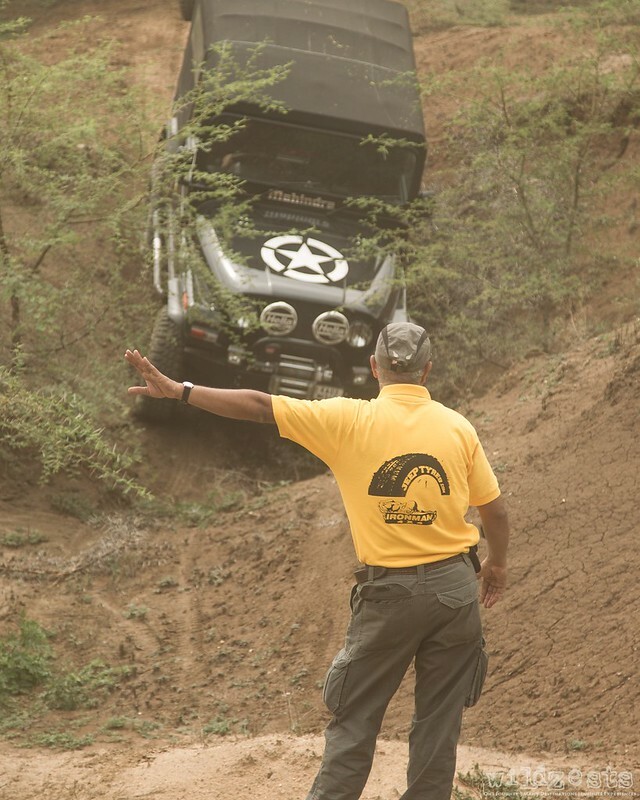 I was mentally prepared to make the Jeep fly at the exit point and the first 2-3 attempts were pretty scary yet exciting. 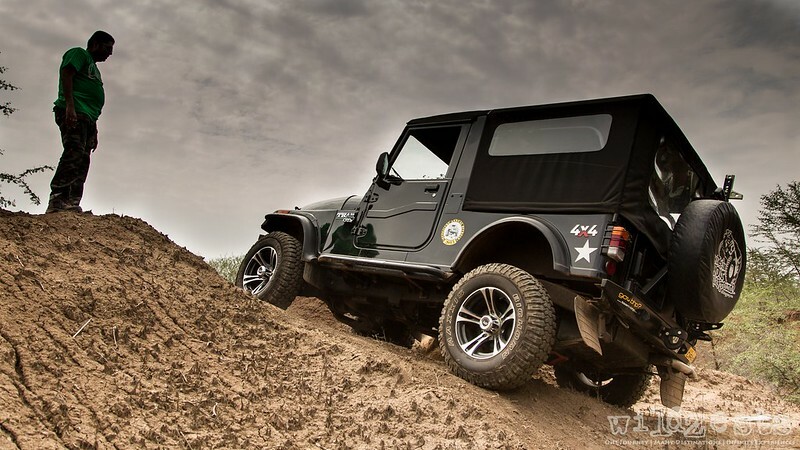 Each time the front tires lifted off the ground, the jeep would get thrown towards the right and land on the extreme end of the exit. I was not sure if this was because of the angle of my approach or something that I had no control over, but the cause of concern was a small rut at the right-most edge of the exit which was where I was landing after the first bounce. Eventually, on the 4th attempt, my front right tire hit hard in the rut on the right and deflated fully putting an end to my future attempts. I was worried whether it was a tire burst since that meant a big bill, but a more logical explanation was that as the jeep landed the right tire got squeezed inside the small rut releasing all the air instantaneously. Anyway, it wasn't going to be easy changing the tire inside the ditch even with the hi-lift jack and so we decided to winch the jeep out with the flat tire. The winch proved its worth yet again and I was out of the situation in no time. Another jeeper bro helped in changing the wheel and I was ready to hit the road in less than 15 mins. It was already a little past lunch time and everybody was wrapping up. We bade goodbye to everyone and made our way to the exit. The only thought in my mind was to check the tire for any signs of damage and hope for the best!